How To Make Profit in Crude Now? Below is the weekly chart of Crude and its analysis shows that we are bang near an important level and any breach of this level means that bears will take control of this commodity. We are seeing an inverted head and shoulder formation in the crude weekly chart and one need to monitor the $40 psychological barrier because if this level is broken; we are going to see another bearish wave in crude. So, all those following crude can mark this level of $40 and can make big money by going short on breaking of $40 with volume. 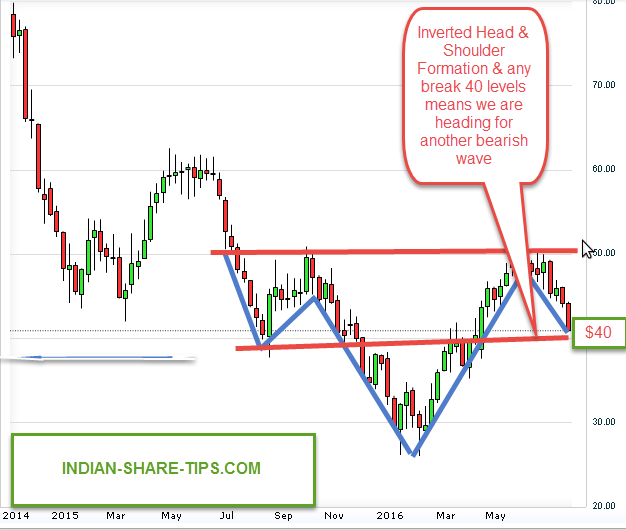 You can read more about head and shoulder pattern here. You can read more about crude updates here and can use our Jackpot tip to make profit before 11:30 AM every day.